I love to improvise when I cook. When I bake? Not so much. I enjoy baking, but the precision of it has always put me off a little. I like cooking because I don’t have to measure, and I can decide to add or remove an ingredient while I work. But baking requires a lot more planning. So when it comes to inventing a baking recipe I get a little unsure of myself. 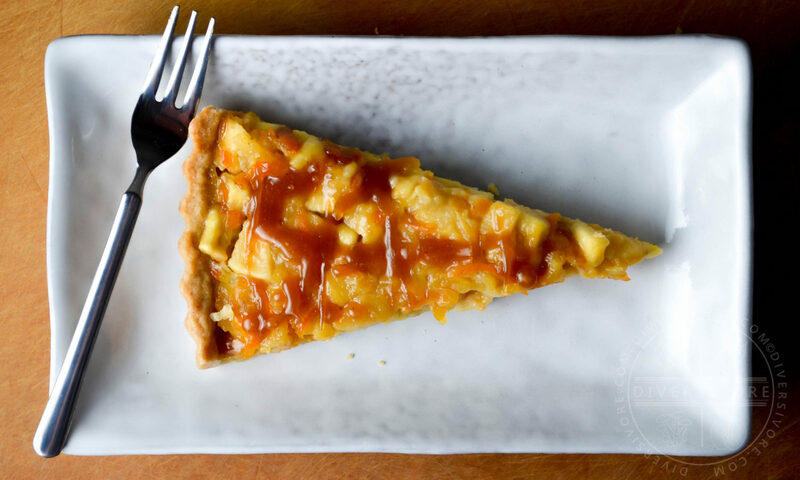 To compound my worries, this tart doesn’t really fit into any conventional molds – it’s not a traditional apple pie, it doesn’t use a flaky/risen crust, and it doesn’t use a citrus curd or a custard. But I swallowed my fears and dove right in. And wow, am I glad I did. This tart is just… I mean, it’s a little bit banal to say that it’s good, but it’s so good. The crust has the buttery feel of a very thin shortbread, and it plays perfectly against the filling. The apples have a bit of bite to them (I personally don’t like mushy apple pie), and the kumquats are bright, sour, and bitter all at once. The caramel adds another layer of flavour and a great little bit of crunch that really brings things together from a textural standpoint. And the Scotch whiskey? Oh boy. Or… ach, laddie. It’s difficult to describe just what the Scotch does that’s so spectacular, but I’m going to go on the record here and say that whiskey-and-citrus is a match made in heaven. Did I mention that it’s in the caramel and the filling? If you’re going to change anything, you could try a different whiskey (bourbon would work), but for the love of pie, don’t leave it out altogether. Ironically, writing a food blog and developing recipes has forced me to measure and plan more. You can’t just pour a little extra something into your dish… your readers need to know how much. You have to remember and write down every little step along the way (even if you think something should go without saying, like ‘remove from the oven’ – surely people know to do this with cooked food?). You can’t just sit down and eat – you have to figure out how best to capture the dish photographically, and whether or not you need any photos of the prep. So maybe I’ll do a little more baking – I’m half-way there already. This is a relatively time-intensive recipe, but not a difficult one. Plan ahead and you’ll find that it actually comes together quite easily. The crust can be substituted for another short crust recipe if you prefer, but I don’t recommend using a flaky pie dough. You want something firm to stand up to the relatively soft tart filling. Make sure that you get the crust nice and thin. If you don’t have a large tart tin like the one called for in the recipe, you can use a very large pie dish. If you only have smaller dishes, I would recommend either a) baking two pies, or b) scaling down the recipe, as it won’t work as well if the filling is very thick. The whole tart should only be about 1.5 cm (3/4 inch) thick. Macerating the fruit, sugar, and whiskey helps blend and mellow the flavours while also serving to soften the kumquats. I recommend leaving the mixture in the fridge overnight and breaking this recipe up over two days. I like the kumquat cut into tiny strips and the apple left as a small dice, but you can vary this depending on your personal tastes. If this is your first time making caramel, this is a pretty easy one to work with. The most important thing to remember is that you need to work fast – the difference between caramel and burnt sugar is only a matter of seconds. Once the cooked sugar is a nice golden color, add the other ingredients and watch as the whole thing suddenly looks like it’s about to explode. That’s the fun part about making caramel. (Don’t worry, it won’t explode). The final product will only be pliable for a little while, so make sure to pour it while it’s warm. It will cool into a solid, candy-like caramel, and not a soft chewy one. GOOD NEWS:For a dessert, this is actually pretty good. It’s rich and complex tasting, so a moderately sized piece (1/10th of the tart) is actually just the right amount, and that doesn’t deliver too many calories (again, for a dessert). BAD NEWS:A little high in saturated fat, which is pretty much unavoidable with all the butter. 100 g white sugar (~1/2 cup) separated into two equal portions. Peel, core, and dice the apples. Seed and chop the kumquats. Combine all the fruit with the brown sugar, half the granulated sugar, and the whiskey. Cover and refrigerate for at least 2 hours, preferably overnight. Wait until this step is done before preparing the crust. Combine the flour, sugar, cardamom, and salt in a large mixing bowl. Using a pastry cutter or stand mixer (or two knives if you're a masochist), cut the butter into the dry ingredients. Continue until the pieces are no larger than peas. In a small bowl, combine the egg yolk, vanilla, and cold water. Whisk together, then add to the crust mixture. Mix together until just combined. Form the dough into a ball and chill for 1 hour. Remove the dough from the refrigerator and let it warm up for 5 minutes. Lay out a large sheet of wax paper or parchment paper and roll the dough into a ball on top of it. Roll the dough out into a circle large enough to fit in a 12 inch tart tin. The dough will be quite thin - about 3-4 mm (~1/8 inch). Carefully lift the dough and transfer it to a 12 inch tart tin. Press the sides against the tin and trim any excess. The lip of the crust should come up only about 1 cm (~1/2 inch) or so. Preheat the oven to 350 F. Prick the surface of the tart crust all over with a fork, then place in the oven to blind bake for 25 minutes, or until it is firm and golden. If air gets trapped beneath the tart, you can gently shake the tin to let it out. The final dough should be firm, but still a little bit pliant while warm. Remove the crust from the oven and set it aside to cool. Leave the oven on, unless you plan on waiting a while before making the filling. Note that if you choose to use baking weights, you may want to extend the cooking time slightly, and be sure to remove them with a little time left to allow the crust to brown. Melt the butter for the filling in a large pot over medium heat. Transfer the fruit/sugar/scotch mixture and the flour to the pot and stir. While the mixture is heating, whisk together the remaining sugar and the eggs. Once the apples are beginning to soften and the mixture is quite warm, slowly pour the egg and sugar mixture into the pot while stirring to combine. Once the mixture is evenly mixed, pour it into the prepared tart crust. Take care not to overfill the tart -- if you have extra filling, refrigerate it and use it for something else. Transfer the tart to the oven and bake for 20-25 minutes. The tart should be set, but will remain soft even after cooling. Allow the cooked tart to cool at room temperature, then transfer to the refrigerator for at least 2 hours before adding caramel and serving. Combine the scotch whiskey, butter, and salt and set aside. They do not need to be thoroughly mixed together, but should all be ready to use at the same time. Heat the sugar in a small, heavy pan (preferably cast iron) over medium heat. The sugar should begin to melt and brown fairly quickly. If it isn't melting evenly, give it a gentle stir to ensure that it cooks evenly. As soon as the sugar is a golden yellowy-brown, add the whiskey, butter, and salt. The caramel will immediately (and violently) seize. Stir slowly and gently to melt and mix the ingredients together. As soon as the caramel is well-mixed and opaque, turn off the heat. Drizzle the caramel over the cooled tart. It will harden almost instantly. Note that this is a crispy, candy-like caramel, not a soft/chewy one. This recipe is ideal for a large, thin tart, but it could be adapted to make many small tarts or even a more traditional (i.e. deeper) pie. If you do decide to go this way, note that you should take care not to over-fill the pie, as it won't set as well and may be a little too jammy. You can also modify this to use your favorite pie or tart crust. I love your site! This tart looks completely delicious, but I loved your notes and nutritional advice! Nicely done. Thanks for the compliments! I’m glad you like the add-ons — it’s funny, I personally don’t look for a lot of detail on the recipe itself (thought I put it in for others! ), but I love extra details about the process, background, nutrition, etc. It’s my science background I guess… I just love the data! OMG this sounds fabulous! I think I might try it with a date-based, gluten-free crust. Thanks Elaine! I personally think an almond crust would be really good here. Let me know if you give it a shot! So we really like it. Our kumquat tree is loaded right now but half apple half kumquat seems a little assertive I’m making it again tomorrow wit only one fourth kumquats and the rest apple. Also my caramel was a little grainy and not the right color. I think I didn’t cook it right. I’ll find out if it’s ok to cook the caramel longer. Thank you for this! I’m so glad Kevin! I definitely have a fondness for strong citrus flavours, so I think it’s fair to say that the 50:50 mix might be a bit assertive for some tastes. I think I’ll actually add a recipe note up above on that subject. As for the hard caramel, was it too light? If so, then yes, you can definitely cook it a bit longer. Graininess in caramel is generally caused by sugar recrystallizing. This can happen if some sugar falls back into the pan from the edges. If this is happening to you, try adding a bit more water to the pan to get the sugar to dissolve again (reduce your heat too, as you don’t want to burn the caramel while you do this). Try to make sure that the edges of the pan are free from little bits of sugar when you start too, as they can fall back in and set off a chain-reaction that crystallizes the melted sugar. I generally just pour my sugar in carefully at the beginning, but some people like to wipe with a brush or even a use bit of oil on the outside walls of the pan (not the bottom) to keep the sugar from causing problems. Ultimately these hard caramels are more forgiving that soft ones, but they’re also a bit quicker to cook, meaning you have less time to error-correct. Hope that helps, and thanks so much for your input! Ah, sorry about that! It’s back now – an update I did a while ago caused some recipes to disappear thanks to a code issue. I thought I’d caught all of them – thanks for telling me!